4 Dale Earnhardt and Dale Jr. race in the Rolex 24-hour endurance race at Daytona in a yellow No. 3 Corvette, finishing second in the GTS class and fourth overall. 11 After an aggressive battle for the lead with Tony Stewart in the closing laps, Earnhardt finishes 2nd in the Budweiser Shootout. 15 Sterling Marlin passes Earnhardt for the win on the last lap in the Gatorade Twin 125's. Earnhardt, who was a sitting duck when the race restarted with one lap to go, finished 3rd. 16 After leading much of the IROC race, Dale Earnhardt was bumped aside and sent into the infield grass by Indy Racing League driver Eddie Cheever on the next-to-last lap. Amazingly, Earnhardt regained control and drove back onto the banking at nearly full speed with only moderate damage. On the cool-down lap, Earnhardt drove his green-colored Pontiac Firebird up behind Cheever's on the backstretch and sent it for a spin. 18 Dale Earnhardt, one of the greatest stars in auto racing history, dies from injuries in a last-lap crash after hitting the wall on the final turn of the Daytona 500 while fighting for the 3rd position. 21 Childress announces that his team will race the following weekend, with Kevin Harvick as driver of the No. 29 Goodwrench Chevy. "We're gonna do what Dale would want us to do, and that's race," said Childress. 21 Dale Earnhardt is buried in a private service in his hometown. 22 Teresa Earnhardt thanks the NASCAR community for it's support at Earnhardt's memorial service. 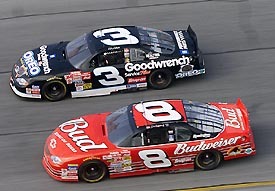 26 Dale Earnhardt Inc. driver, Steve Park, dedicates his win at Rockingham to Earnhardt, while Kevin Harvick finishes 14th in his first Winston Cup race. 4 Teresa Earnhardt turns to fans for help in her fight to stop the release of her husband's autopsy photos. 7 The Orlando Sentinel receives a flood of angry calls and e-mail from race fans, prompting an effort by lawmakers to prevent the release of autopsy pictures in future cases. 9 The International Motorsports Hall of Fame & Museum opens a new exhibit honoring the late Dale Earnhardt and Atlanta renames it's North Turn grandstand after Earnhardt, while countless other tributes continue to spring up accross the country. 11 In his 3rd Winston Cup race, Kevin Harvick wins by inches at Atlanta, just as Earnhardt has done a year ago. Harvick dedicates the emotional win to Earnhardt. 14 A Florida Senate committee unanimously approves a bill that requires a judge's permission to release autopsy photos, a measure sought by Dale Earnhardt's widow in her effort to keep a newspaper from seeing pictures of Earnhardt. 25 IROC announces that Dale Earnhardt's entry would not be filled in the remaining three International Race of Champions events the season. 11 President Bush meets the Earnhardts while visiting Charlotte. 29 Rusty Wallace circles the track carrying an Earnhardt flag after winning on Earnhardt's birthday. 9 Kerry Earnhardt joined his late father Dale and his younger brother Dale Jr. as winners at Michigan International Speedway by winning the Flagstar 200 ARCA RE/MAX Series race. "My dad, he was there with me," Kerry said. "He's always with me and always will be." 13 A judge rules in favor of Teresa Earnhardt, stating that Dale Earnhardts autopsy photos cannot be made public under a new state law that restricts access to such images. 8 NASCAR returns to Daytona where teammates Dale Jr. and Michael Waltrip finish 1-2 in the Pepsi 400. Dale Jr. dedicates the emotional win to father. 10 The North Carolina Legislature honored the family of Dale Earnhardt by approving a resolution praising the late NASCAR driver and his contributions to his home state of North Carolina. 10 Bill Elliott, a 15-time winner of the National Motorsports Press Association's Most Popular Driver Award, removes his name from the 2001 award ballot in honor of Dale Earnhardt. 21 NASCAR releases findings of its investigation of Dale Earnhardt's fatal wreck, concluding that cars aren't safe enough in crashes, but not blaming a broken seat belt as the cause of death of the racing great. A combination of various factors from the accident are blamed. 1 In a Busch Grand National race, Steve Park is slammed into in a bizarre wreck that began under a caution flag when, apparently, his steering wheel came unlatched as he prepared to go back to green-flag racing. Kenny Wallace takes over duties for the Pennzoil DEI car for the rest of the season, while Park recovers from injuries. 1 Dale Earnhardt is inducted into the National Motorsports Press Association's Stock Car Racing Hall of Fame. Also inducted are Bill France Jr., Glen Wood and A.J. Foyt. 24 At Dover Downs, NASCAR returns to action for the first time following the September 11 attacks. Dale Jr wins the race and makes a Polish Victory Lap with the American flag. 25 Dale Earnhardt Jr. announces he will return the No. 3 to racing next season, using his late father's number in two Busch Series races. 1 Chevrolet announces a Monte Carlo SS Dale Earnhardt Signature Series, inspired by the legendary late Dale Earnhardt. 3 Harvick wins RCR's first Busch Series title. "I guess the best thing we can do at this point is to dedicate this season to Dale Earnhardt," said Harvick. 10 The readers of "NASCAR Winston Cup Illustrated" name Teresa Earnhardt as the magazine's Person of the Year.